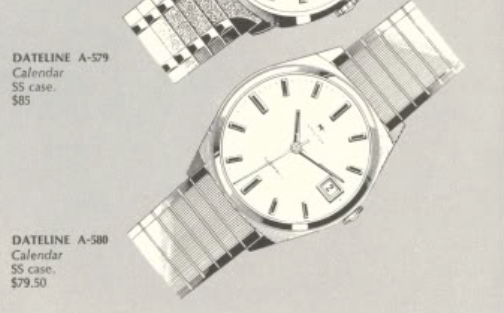 1969 is often viewed as a pivotal year in Hamilton lore... mainly because it was the last year of US production in Lancaster PA. You'd be led to believe that every model e-580nded in 1969 and all new watches were introduced in 1970... but that is not the case. Many models were discontinued after 1969 but quite a few model carried into the 1970's. One of them was the 1965 Dateline A-580. It was produced through 1971. The Dateline A-580 came in a one-piece stainless steel case with a silver dial and hour markers with black inserts. Rather than luminous paint on the hands, the hands feature black paint so they match the hour markers. The case is interesting in that it is sort of round and it's also sort of cushion shaped so it harkens back to Hamilton's very first men's wrist watch. Inside the watch is a 17 jewel 694A automatic movement with a date complication. My project watch arrived in very good shape. The bracelet that came with the watch is not original and the spring-loaded ends are designed to accommodate varying lug spacings but they're really best designed for wearing grooves into the lugs and damaging the case... so this bracelet will be replaced by a nice strap. Looking at the case back it's clear that this is a one-piece design and opens through the crystal. From behind, the 694A looks like any other ETA automatic from the period. Everything gets taken apart and thoroughly cleaned. Reassembly is straightforward as long as you take it nice and slow with the reinstalling the date wheel and it's associated springs. The first step is to get the movement back in running order. With a few winds to the mainspring the watch should tick back to life once the balance is reinstalled. Although the watch balance has good motion, the watch timer is picking up extraneous noise. So there must be a piece of dust or something inside. Recleaning hairspring gets the watch to run with cleaner performance but the beat rate is a little fast and the beat error is a little high. The amplitude is low as well, but that's probably more related to the relatively few winds of the mainspring that I performed. First I'll wind the watch more fully and then I'll tweak the regulator and hairspring stud. Making good progress... it's doesn't take much to change the beat rate so I'll leave it running a smidgen slow for a day to settle in before final tweaking. As you can see, the beat error is now close to zero and the amplitude is a very healthy ~300 degrees. The last few steps are to reinstall the dial and place the movement back in the case. I need to set the time forward slowly until the date changes - then I can install the hands at 12:00 so the date will change at midnight. A new crystal always makes a great finishing touch. 29.3mm should do the trick. The finished project looks great with a new unpadded lizard strap. This is a very classic-looking 1960's watch, I can see why it was made for several years.